MADE IN U.S.A. The Battic Door Whole House Attic Fan Ceiling Shutter Seal is an energy-saving insulating cover for Whole House Attic Fans. It reduces air-leakage through the whole house attic fan saving the homeowner heating and cooling loss and energy costs. The Battic Door Whole House Attic Fan Shutter Seal is installed over the ceiling shutter from the house side in the fall and removed in the spring. Attic access is not required! Simple to install - just Velcro the cover into place. By reducing the amount of heat and moisture leaking into your attic, the severity of ice dams and attic mold is greatly reduced! Fits max 48" x 48" whole house attic fan ceiling shutters. Kit includes durable, attractive, non-toxic, white-colored, space-age foam, only 3/16" thick, yet has an R-value of R-8. The foam air seals and insulates the attic fan, stopping heating and cooling loss and air leaks. The insulation is a Class A/Class 1 fire rated foam with superior thermal performance. No fiberglass - no itching. We use white Velcro to seal the cover. No magnets. Magnets are more expensive, can be weaker, and most shutters are aluminum. Ceiling Shutter Seal Cover provides an air seal reducing any air leakage. 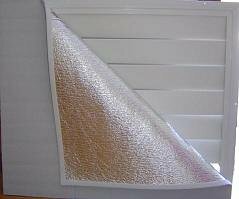 Works like a storm window for your whole house fan! Reduce drafts, improve comfort, and save energy costs all year-'round! Attic access is not required! Installs easily - TRIM TO FIT. Cover and seal the attic fan from the house side in minutes, no tools are needed! If you have any questions about this product by Battic Door, contact us by completing and submitting the form below. If you are looking for a specif part number, please include it with your message. Monte Carlo Colony Super Max 60-inch Brushed Steel Ceiling Fan | H: 11.5" W: 60" L: 11.5"